If you're lucky, you'll be given the gift of time to start making and preserving memories. If you've got access to your loved ones and you know your time with them is limited, take a few moments and capture your experiences in these five simple ways. You'll be grateful you did. When I read last week that Celine Dion is preparing for this to be her last Christmas with her ailing husband, I became quite emotional. I can say first-hand that nothing ever prepares you to lose a loved one. Whether it comes as a surprise or after a prolonged illness, death and the heartbreaking void it leaves behind is something we can only deal with as individuals, because grief manifests itself differently within each of us -- there's no handbook or time-frame; you just do the best you can to cope. I've lost a few people close to me in the past three years, including a parent and a beloved aunt. And despite their voices playing clearly in my mind as I think of them, one of my biggest regrets is that I didn't make a greater effort to document their stories and memories using something that is so accessible to all of us -- technology. 1. Record conversations that matter. Think of simple questions you'd like to ask your loved ones and choose quiet moments to capture their answers on an audio recording device. Most smartphones come with built-in recording apps that will save files right to your phone, making them easily shareable with your whole family. Some of my favourite photos of loved ones are the candid shots. The unplanned glances, the smiles that make their eyes crinkle, the stern warning looks... these photos capture the essence of who they are, so turn off the selfie camera and point the lens towards your loved ones. Nothing beats a photo that puts a smile on your face! 3. A lesson (or two) in history. Older relatives can be treasure troves of family history. They are links to our past and they can sometimes hold key answers to our present. Make time to record interviews with them -- make it a series if you have to. Ask questions about your family, about their advice for you, about their joys, their regrets, and about that secret family recipe that's been passed down through the generations. 4. A journal just for you. This one isn't tech related, but it's just as good. Many book stores now carry journals with themes -- letters, favourite quotes, advice blocks and thoughtful questions. Give your loved one a journal, ask them to fill it out and add whatever they can to it (including photos). From cute anecdotes to thoughtful letters, this journal will become something you turn to on difficult days because not only is it filled with thoughts from your loved one, it will also preserve something you'll likely never see again -- their handwriting. 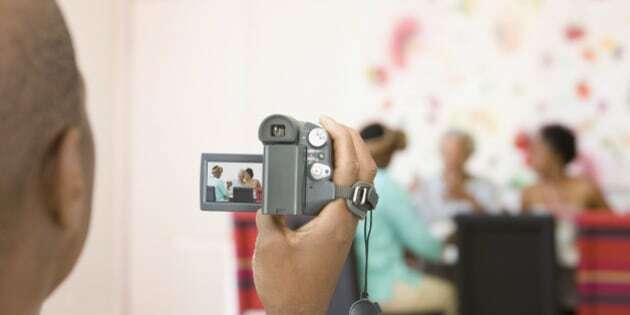 The easiest and perhaps the most fun way to preserve memories with your loved ones is to turn on your phone's video camera and start recording. From filming them cooking your favourite meal in the kitchen to capturing them sitting on the couch, yelling at you to turn the camera off, to recording them belting their favourite songs in the car, there are so many opportunities to preserve these moments on video. You can eventually use all your footage to create a montage of visual memories that will stay with you for years to come. Say what you will, but we're living in a world where despite the convenience, technology is drifting us further apart and hurting the social aspects of our relationships. Take advantage of the gift of time and use technology to bring you closer to the ones you love. Once you're down the road looking back, you'll be glad you did.